Amazon.com description: Product Description: An intoxicating collection of short fiction by one of the most beloved writers of our time. Eva Luna is a young woman whose powers as a storyteller bring her friendship and love. Lying in bed with her European lover, refugee and journalist Rolf CarlÃÂ©, Eva answers his request for a story Ã¢ÂÂyou have never told anyone beforeÃ¢ÂÂ with these twenty-three samples of her vibrant artistry. Interweaving the real and the magical, she explores love, vengeance, compassion, and the strengths of women, creating a world that is at once poignantly familiar and intriguingly new. 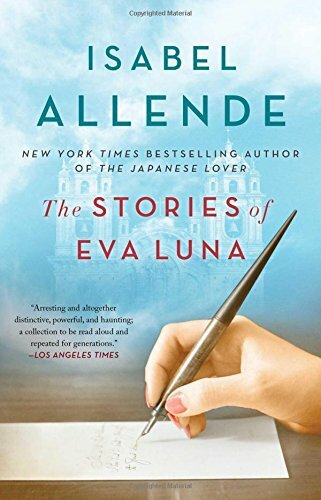 Rendered in her sumptuously imagined, uniquely magical style, The Stories of Eva Luna is the cornerstone of AllendeÃ¢ÂÂs work. This treasure trove of brilliantly crafted stories is a superb example of a writer working at the height of her powers. About: In this magical bestseller, the story-telling heroine of Eva Luna returns with a rich treasure trove of tales--two dozen vibrant, enchanting demonstrations of her artistry.